Despite reading Inside of a Dog by Alexandra Horowitz I have few cues as to what exactly my bassets think about. I do know that food is their main motivation – go near the fridge or cooker and you’ll find a basset can raise itself from a seemingly deep slumber and move at lightening speed to be at your feet. Just in case you know. Something might need picking up or even better still we might succumb to their charms and feed them. Also neck rubs are a big thing for Mason, he’ll do pretty much anything to get your attention so you’ll rub his neck so his back feet thumps like a rabbit. There is little that Mason misses though – he will watch and wait and anticipate. Here he is plotting mischief and hiding from the camera. I have been lurking in the wings reading your blog for a couple of weeks now. I just have to speak up – your photography is gorgeous and your shots and stories of the bassies as you call them are too cute!!! As a fellow owner of two bassets, I salute you for capturing their personalities perfectly! Keep on doing what you are doing – please. I eagerly look forward to checking out your blog daily to see what awaits me. Hello Joanna and welcome from out of the shadows, great to have you here! Great to know you have two bassets – will check out your blog to see if I can find them! Oh Mason, what is going on in that devilish little mind of yours!! best not to wonder I suppose, for surely it’s no good!!! But I can’t help the desire to want to give you a big kiss on that freckled nose!!! Hi Liz, thought of you as we turned another page in our calendar. 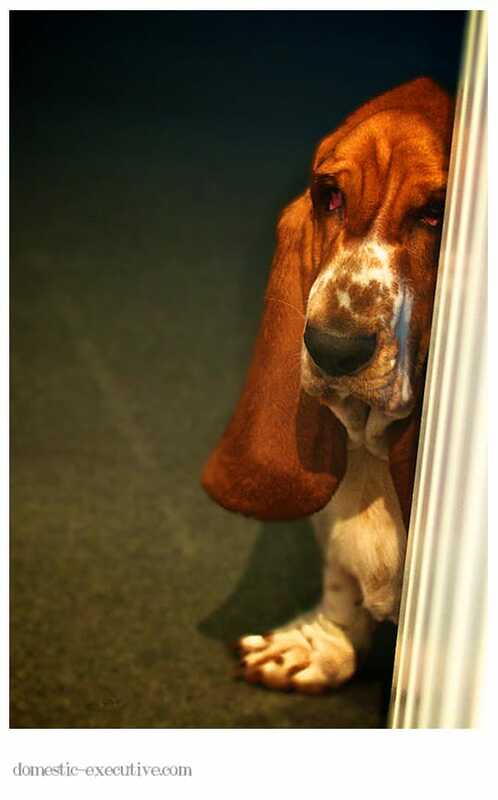 Hope you’re still loving having the basset in your home! Absolutely!!! I eagerly await the opportunity to turn the pages and see who gets to share the coming month with. This month is Fortnum, delicately sticking his tongue out at me!!! 😉 I adore the boys and will be sad when their time in my kitchen is over 🙁 thank you again so much for sending the calendar to me! !